oven or grill. Allow the turkey to rest for approximately 20 minutes to let the juices settle and redistribute throughout the meat. The meat will be very tender, flavorful and easier to carve. Always use a sharp knife when carving. There are two basic carving methods the traditional method, often used for carving at the dining table, or the kitchen method, which is easier and more practical, to be done in the privacy of your own kitchen. 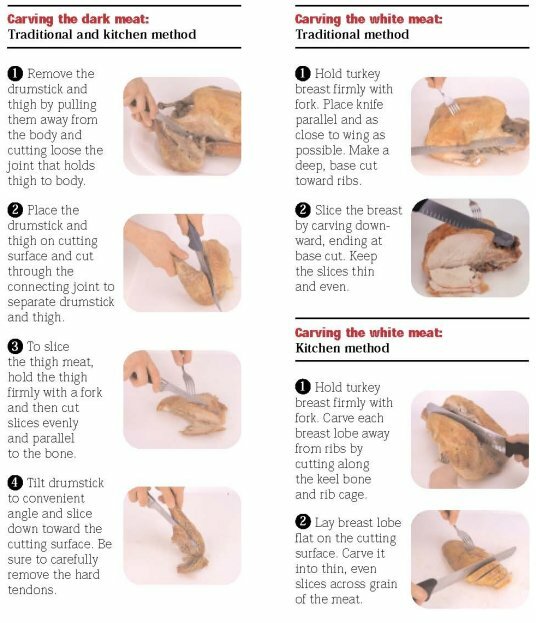 Wash hands, utensils, and cutting boards with hot soapy water before and after handling turkey. Debone turkey and refrigerate or freeze all leftovers in shallow containers within 2 hours of cooking. Use leftover turkey and stuffing within 3-4 days; gravy within 1-2 days. Cooked turkey keeps for 3-4 months in freezer. Reheat foods thoroughly to a temperature of 165 °F. or until hot and steaming; bring gravy to a boil before serving.